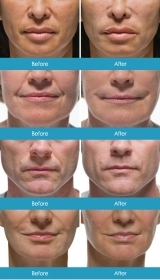 Natural collagen begins to break down as you age, causing skin laxity, wrinkles and a loss in facial volume, which can make your skin look and feel old. 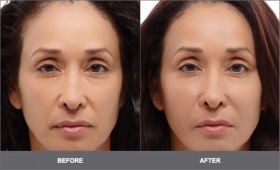 The best way to refresh your appearance is by replenishing the volume your skin has lost, which diminishes wrinkles, resulting in a much more youthful look. 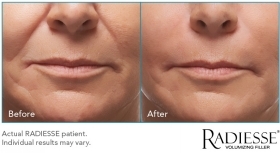 Radiesse Volumizing Filler is an ideal choice. 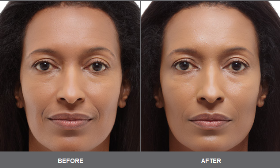 In addition to providing immediate volume correction, it also stimulates production of your own natural collagen. The result is both immediate and long-lasting. 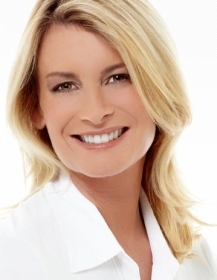 An abundance of healthy collagen is what gives skin a smooth and youthful appearance. 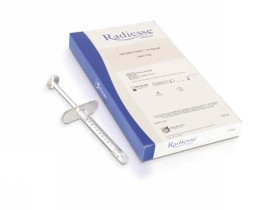 But what's unique about Radiesse is that it provides structure and stimulates your own natural collagen to grow, which is going to continue for several months and will extend the initial effect of Radiesse. In many clients, results last more than a year. 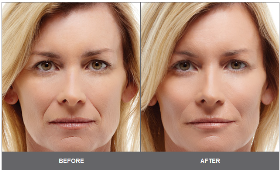 It is FDA approved for corrections of moderate to severe wrinkles and folds, such as nasolabial folds. 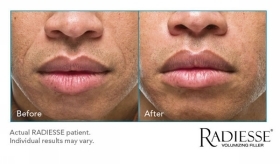 Upon injection, Radiesse immediately provides the lift needed to diminish signs of aging because of the calcium-based microspheres and gel that comprise the product.